AlcorMP tool V8.12.08 can repair corrupted Alcor chip controller .AlcorMP V8.12.08 format tool support formatting Alcor AU6981, AU6982, AU6983, AU6984, AU6986, AU7640, AU3150B51, Au3150C53 .Download AlcorMP tool and repair your flash disk now . AlcorMP recovery tool V8.12.08 has been designed to reformat Alcor chip controllers .AlcorMP tool is a free Alcor format software .Alcor MP V8.12.08 support formatting alcor chip controller With this Chip Series Alcor AU698X and Alcor AU3150X .AlcorMP.ini software allows you to repair and fix Alcor format errors such as Raw flash disk ,Write protected memory ,insert disk error and other format issues . AlcorMP V08.12.08 support formatting the following Flash chip controllers "Alcor AU6981, AU6982, AU6983, AU6984, AU6986, AU7640, AU3150B51, Au3150C53.Please don't use this format tool with another chip controller .You must determine your USB flash disk information first , you can use Chip genius software or USBDeview V2.30 utility . How to format Alcor flash controller ? Download AlcorMP V8.12.08.rar from download links below . Insert corrupted Alcor USB stick to your PC . 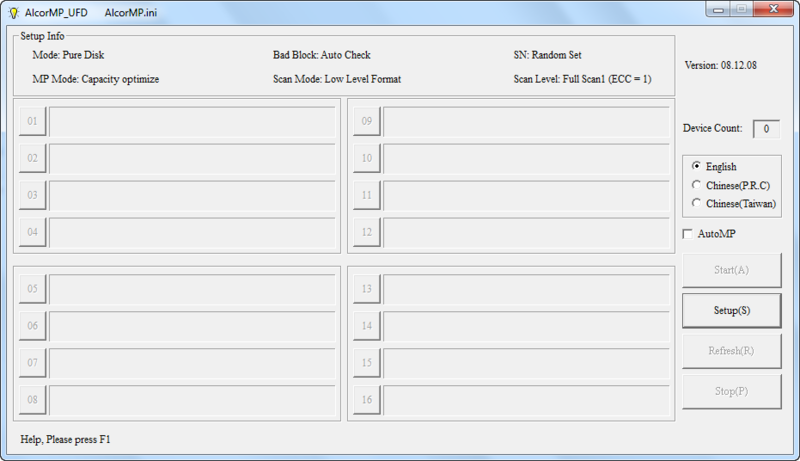 Extract AlcorMP V8.12.08.rar and open AlcorMP v8.12.08.exe . If your usb controller is supported , you will see flash drive information appears on the program interface . 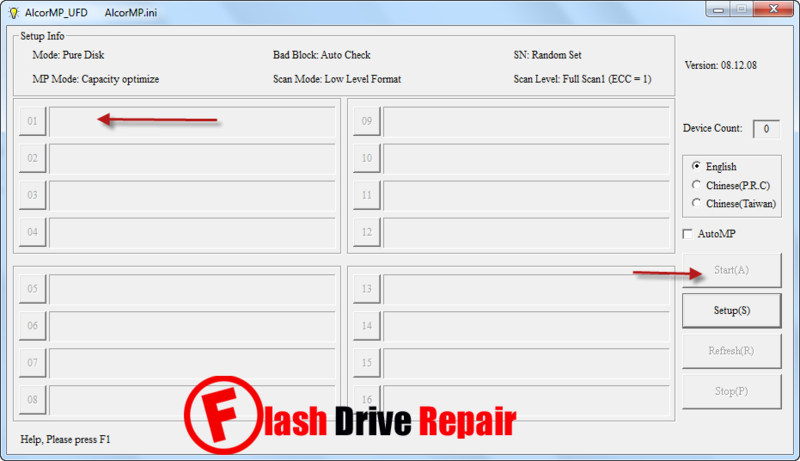 Click Start to format Alcor flash disk . Wait until finish updating alcor firmware .